Edelbrock camshafts are matched to Edelbrock Total Power Package components for proven performance, taking the guesswork out of camshaft selection. They are compatible with OEM or Edelbrock hydraulic roller tappets which reduce friction, virtually eliminate break-in problems, and permit higher valve velocities for increased performance. Performer-Plus flat tappet camshafts provide improved performance and maintain great vacuum for power accessories. 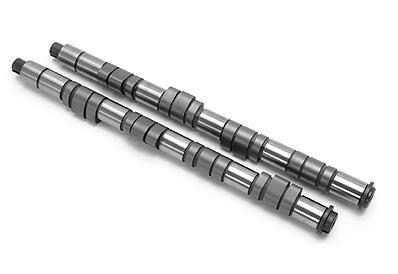 Performer RPM hydraulic flat tappet camshafts are designed for high performance street applications while still providing great low-end torque and increased horsepower up to 6,500 rpm. Finally, our new line of Rollin’ Thunder™ hydraulic roller camshafts are modern designs that provide improved horsepower and torque over flat tappet cams, plus they also offer great idle and excellent vacuum to support power accessories. Designed for optimum torque from the low-end to the mid-range, Performer-Plus camshafts match with Performer manifolds for vehicles operating from off-idle to 5500 rpm. They are smooth idling cams for daily drivers, trucks, vans, RVs and 4×4s. You can expect a major improvement in throttle response and torque. In the manifold section you’ll find torque graphs showing the power gains from Performer manifolds and Performer-Plus cams. All camshafts include flat tappet lifters (except for cams designed for use with stock roller lifters), assembly lube and instructions. 3 our most popular Performer-Plus camshafts for small-block Chevys are 50-state street legal. Designed to work with Torker II manifolds for performance from 2500 to 6500 rpm, these camshafts are ideal for high-performance street, drag or marine applications. Torker-Plus cams have a slightly rough idle and are not suitable for trucks or towing applications. Hydraulic flat tappet lifters are included with each camshaft. Edelbrock Rollin’ Thunder camshafts are designed to improve horsepower and torque, produce a great sounding performance idle and provide excellent vacuum at idle to support power accessories. Rollin’ Thunder camshafts feature more aggressive lift profiles than possible with conventional flat-tappet hydraulic cams, without excessive valve overlap that can compromise low rpm drivability; reduced friction provided by roller tappets makes this combination of accelerated valve lift and reduced duration possible. Edelbrock Rollin’ Thunder camshafts are performance matched to Edelbrock Total Power Package components for proven performance.